Free Public Transit So Cal: Los Angeles, three days a year in traffic jail.... for everyone! westsidetoday.com: "Since 1985, Los Angeles County has seen a spike of over 1.7 million new registered motor vehicles; resulting in the LA region ranking the worst in gridlock nationwide. According 2014 Inrix Traffic Scorecard, Angelinos waste an average of 64 hours per year stuck in traffic. The state’s transit infrastructure faces a funding shortfall of approximately $72 billion over the next decade. Transit is the “pressure relief valve” for roads and highways, which can no longer be easily expanded. 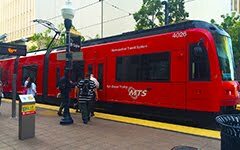 Transit must be included in the mix of multi-modal transportation funding solutions to keep L.A. moving."